The euro sign (€) is the currency sign used for the euro, the official currency of the European Union (EU) and some non-EU countries (Kosovo and Montenegro). The design was presented to the public by the European Commission on 12 December 1996. It consists of a stylized letter E (or epsilon), crossed by two lines instead of one. The character is encoded in Unicode at U+20AC € EURO SIGN (HTML &#8364; · &euro;). In English, the sign precedes the value (for instance, €10, not 10 €, unlike most other European languages). In some style guides, the euro sign is not spaced (10€). The euro design featured in the Windows font Comic Sans originally had a cartoon eye inside a serif. This was removed to make the symbol fit character-width restrictions because of its use with numerals. It was jokingly commented to be the result of potential legal action by the EU. The euro currency sign was designed to be similar in structure to the old sign for the European Currency Unit (Encoded as U+20A0 ₠ ). There were originally 32 proposals; these were reduced to ten candidates. These ten were put to a public survey. After the survey had narrowed the original ten proposals down to two, it was up to the European Commission to choose the final design. The other designs that were considered are not available for the public to view, nor is any information regarding the designers available for public query. The European Commission considers the process of designing to have been internal and keeps these records secret. The eventual winner was a design created by a team of four experts whose identities have not been revealed. 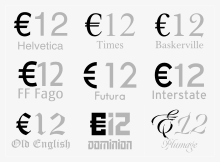 It is assumed that the Belgian graphic designer Alain Billiet was the winner and thus the designer of the euro sign. Inspiration for the € symbol itself came from the Greek epsilon (ϵ) – a reference to the cradle of European civilization – and the first letter of the word Europe, crossed by two parallel lines to ‘certify’ the stability of the euro. 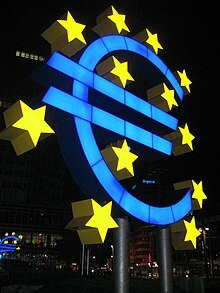 The official story of the design history of the euro sign is disputed by Arthur Eisenmenger, a former chief graphic designer for the European Economic Community, who claims he had the idea prior to the European Commission. The European Commission specified a euro logo with exact proportions and colours (PMS Yellow foreground, PMS Reflex Blue background), for use in public-relations material related to the euro introduction. While the Commission intended the logo to be a prescribed glyph shape, type designers made it clear that they intended to design their own variants instead. 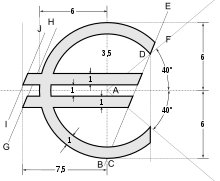 Generating the euro sign using a computer depends on the operating system and national conventions. Some mobile phone companies issued an interim software update for their special SMS character set, replacing the less-frequent Japanese yen sign with the euro sign. Later mobile phones have both currency signs. The euro is represented in the Unicode character set with the character name EURO SIGN and the code position U+20AC (decimal 8364) as well as in updated versions of the traditional Latin character set encodings. In HTML, the &euro; entity can also be used. An implicit character encoding, along with the fact that the code position of the euro sign is different in common encoding schemes, led to many problems displaying the euro sign in computer applications. While displaying the euro sign is no problem as long as only one system is used (provided an up-to-date font with the proper glyph is available), mixed setups often produced errors. One example is a content management system where articles are stored in a database using a different character set than the editor's computer. Another is legacy software which could only handle older encodings such as ISO 8859-1 that contained no euro sign at all. In such situations, character set conversions had to be made, often introducing conversion errors such as a question mark (?) being displayed instead of a euro sign. Ctrl+⇧ Shift+u followed by 20ac in Chrome OS, and in other operating systems using IBus. ^ Alt+0128 is the correct alt code for the Euro under most system locale settings. Under Cyrillic-based system locale settings (using Windows code page 1251), Alt+0136 must be used. Neither will work under Japanese (932), Korean (949) or Traditional Chinese (950) system locale settings. The Compose key sequence for the euro sign is =E. Placement of the sign also varies. Countries have generated varying conventions or sustained those of their former currencies. For example, in Ireland and the Netherlands, where previous currency signs (£ and ƒ, respectively) were placed before the figure, the euro sign is universally placed in the same position. In many other countries, including France, Belgium, Germany, Italy, Spain, Latvia and Lithuania, an amount such as €3.50 is usually written as 3,50 € instead, largely in accordance with conventions for previous currencies. In English, the euro sign—like the dollar sign ($) and the pound sign (£)—is placed before the figure, unspaced, as used by publications such as the Financial Times and The Economist. When written out, "euro" is placed after the value in lower case; the plural is used for two or more units, and euro cents are indicated with a point, not a comma, e.g., 1.50 euro, 14 euros. No official recommendation is made with regard to the use of a cent sign, and usage differs between and within member states. Sums are often expressed as decimals of the euro (for example €0.05, €–.05, or 0,05 €, rather than 5c). The most common abbreviation is "c", but the cent sign "¢" also appears. Other abbreviations include "ct" (particularly in Germany and Lithuania), "cent." in Spain and Italy, "snt" (Finland) and Λ (the capital letter lambda for λεπτό, "lepto", in Greece). ^ Connare, Vincent. "Keynote: From the Dark Side… Speak to Me". Ampersand Conference 2011. Archived from the original on 2 July 2011. Retrieved 30 June 2011. ^ "Belg Alain Billiet ontwierp het euroteken" [The Belgian Alain Billet designed the euro sign]. Gazet van Antwerpen (in Dutch). 10 October 2001. Archived from the original on 1 April 2012. Retrieved 24 September 2011. ^ a b "European Commission – Economic and Financial Affairs – How to use the euro name and symbol". Ec.europa.eu. Retrieved 7 April 2010. ^ Connolly, Kate (23 December 2001). "Observer | Inventor who coined euro sign fights for recognition". London: Observer.guardian.co.uk. Retrieved 21 August 2009. ^ Typographers discuss the euro, from December 1996. ^ Mac OS: How to type the Euro glyph, Apple Technical Report TA26547 (11 September 2003). ^ Euro: valutateken voor of achter het bedrag?, Nederlandse Taalunie. Retrieved 21 December 2006. ^ "Pareizrakstības nodarbības #8. Eiro simbola pareiza rakstīšana. Otrā daļa - - Mr. Serge". mrserge.lv. 29 April 2014. ^ OP/B.3/CRI, Publications Office -. "Publications Office — Interinstitutional style guide — 7.3.3. Rules for expressing monetary units". publications.europa.eu. ^ Article on linguistics: Currency units, TranslationDirectory.com. Retrieved 25 June 2008. ^ Economist.com Research Tools: Style Guide, TranslationDirectory.com. Retrieved 16 April 2012. Wikimedia Commons has media related to Symbol of the euro. Typing a Euro symbol on a non-European QWERTY keyboard. Several methods are shown for and others special characters.